As we saw a couple of weeks ago back in London, every top tier deck ran four of some type of special energy. I have previously compared decks that run Enhanced Hammers and decks that don’t, and the only cards I removed between the two decks were the hammers. Both times that I previously did this analysis, I reached the clear conclusion that (somewhat surprisingly) the deck that did not run hammers fared better than the deck that did carry Enhanced Hammers. 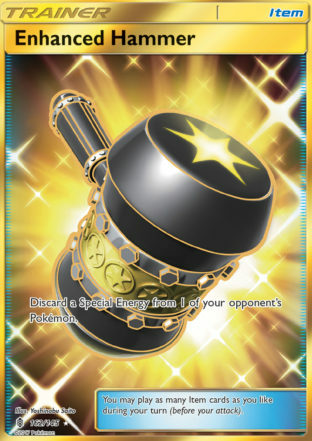 However, with such an increase in special energy, it appears that the meta has changed (75% of the meta decks I faced last month ran SPE), so teching E Hammers into your deck might help you disrupt many of your opponents. I played twenty matches with this list and then twenty matches with a similar list in which I removed the four E Hammers and replaced them with two Field Blowers, a Guzma, and a Lillie. I know this isn’t the pure meta Drampa deck, but we can go over my inability to conform with the general population at some other time. I will admit I didn’t really think very hard about the four cards to replace the hammers. I knew I wanted more Trashalanche fuel, Guzma is an awesome card, and I love Lillie as a one of in decks that run four Ultra Balls. There are times that I was able to Lele for Lille (yeah try saying that three times fast) on turn one and get six or seven cards… and then I played Big Wheel GX to put ten MORE cards in my hand. Think about that for a second in this non Shaymin era. I know Brigette is the preference – and Bridge is a great turn one play – but Lille and Big Wheel spam cards into your hand like no other deck in the format. Combine that with the fact that I get seven cards from any draw supporter I play after Big Wheel, and I NEVER have draw support issues in this deck. So you make your own judgement from this. Hammers won one more match, but the non Hammers deck had a much tougher schedule in that it had three more meta decks than the Hammers version. The non Hammers version also went 8 W 7 L vs meta decks while the Hammers version went 5 W 7 L against meta decks. Nine of the twelve meta decks that the Hammers version faced ran SPE; ten of the fifteen decks the non Hammers version faced ran SPE. The E Hammer list went 9 W 5 L against decks that played SPE, but it also went 4 W 5 L against meta decks that played SPE. The non E Hammer list went 7 W 6 L against decks that played SPE and split 5 W 5 L against meta decks that played SPE. From this perspective, if you think that every meta deck in Memphis will run SPE, running E Hammers might not be the right call. As I mentioned, in the previous analyses I did, it was clear that the non Hammers build was the better choice. Right now, however, this analysis seems to be very even, and if you think that the meta will be even more inundated with SPE, then carrying four E Hammers will probably help you win some matches. However, the decklist with hammers lost more games to meta decks even though the meta decks it faced played more SPE than the ones the non Hammer list faced, so I don’t know exactly what to tell you. Should you play E Hammers in Memphis? My gut says yes, but the numbers kind of say no… although that no is not nearly as strong as it was when I previously did this analysis.